Timelines, Darryl Lauster’s newest exhibition, is a discrete investigation of American history, reflecting on aspects of our nation’s identity and on the various sensibilities that go into our feeling of “American-ness”. Lauster employs a multi-layered process that involves appropriating and transforming various historical icons, folklore, and popularly accepted narratives and institutions. 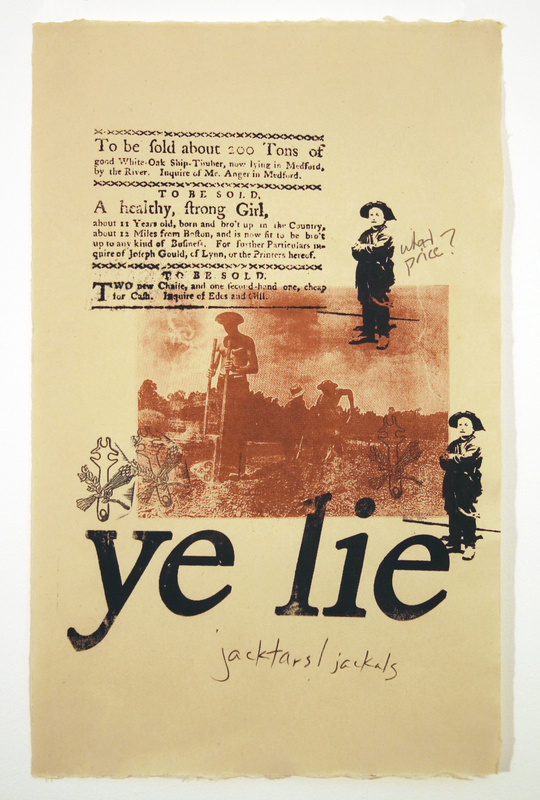 The artist’s use of collaged text, images and handwriting has a critical edge, since these fragments are frequently appropriated out of context and made to mirror the rhetoric we are familiar with from current political discourse. In this way they criticize a paradoxical nostalgia for times and events that were themselves corrupt but at present are accepted without critical thought. One fictive element that appears in all the prints in the exhibition is a de facto signature attributed to an actual man who lived in the 18th century named Samuel Gray. This signature, an object resembling a wrench, is appropriated from the national seal, with a quiver of arrows and an olive branch. 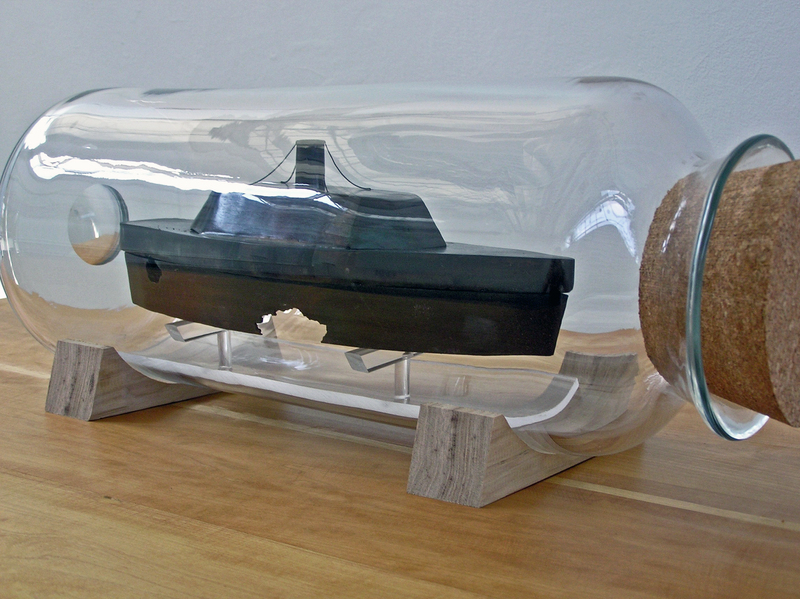 Time Capsule, the “ship in a bottle” displayed on a wooden table, is a replica of a Confederate ironclad Albemarle. Its transformation through the filter of hobbycraft reflects, in equal measure, Lauster’s fascination with and repulsion by the popular pastime of civil war recreation, in which the true horror of such an event can be rendered innocuous. The works on paper use screenprint, graphite and lampblack on hemp in a free interpretation of post-war Rauschenbergian abstraction. Using public domain images from the Library of Congress, they are fashioned to replicate vintage broadsheets, incorporating a font that mimics that of early American newspapers. The exhibition’s largest pieces use characteristics of traditional wall-based works and sculpture, combining new and old to create the best window on the artist’s idiosyncratic take on our history. The contrast between the archaic and modern elements is most striking in these map works Washington 1791-2011 and Gulfcoast 1803-2011 . Washington is affixed to the wall with what look like railroad nails. It’s surface is printed with modern typeface over a map of the city and is interlayed with coins, specifically “Indian” head nickles. The names of displaced native tribes from the area are jotted on the surface with the casualness of a crumbled shopping list left in the bottom of a grocery basket. Darryl Lauster "Gulf Coast 1803-2011" detail. The tanks from Risk surround the Branch Davidian Monopoly Hotel in Waco Texas. In Gulf Coast Lauster’s theme of fractured communication throughout history is handled with both gravity and levity. This work, a moveable classroom chalkboard whose surface has been replaced with a sheet of thick, frosted Plexiglas, retains many of the common historical references found elsewhere in this show, but it also contains remnants from twentieth-century games including Battleship! and Operation. These kitsch relics from the recent past, together with cartoon elements and diverse, haphazard scribblings – political declarations, the names of slave ships servicing the port of New Orleans, the rules of play for an obsolete boardgame – present a portrait of American history that, one feels, is closest to the artist’s own. Darryl Lauster has exhibited nationally at the Louise Wells Cameron Museum of Art, Appalachian State University, Millennium Plaza Park, the Nicolaysen Art Museum, the John Michael Kohler Foundation and the Contemporary Arts Museum, Houston. His work can also be found in the permanent collections of the Philadelphia Museum of Art and the Museum of Fine Arts, Houston. He has received grants from the Joan Mitchell Foundation and the Peter Reed Foundation, and has served residencies at the Ucross Foundation, the Wassaic Project and the Houston Center for Contemporary Craft. He also serves as the Collections Manager of the Samuel Gray Society, an institute dedicated to 18th century American history.